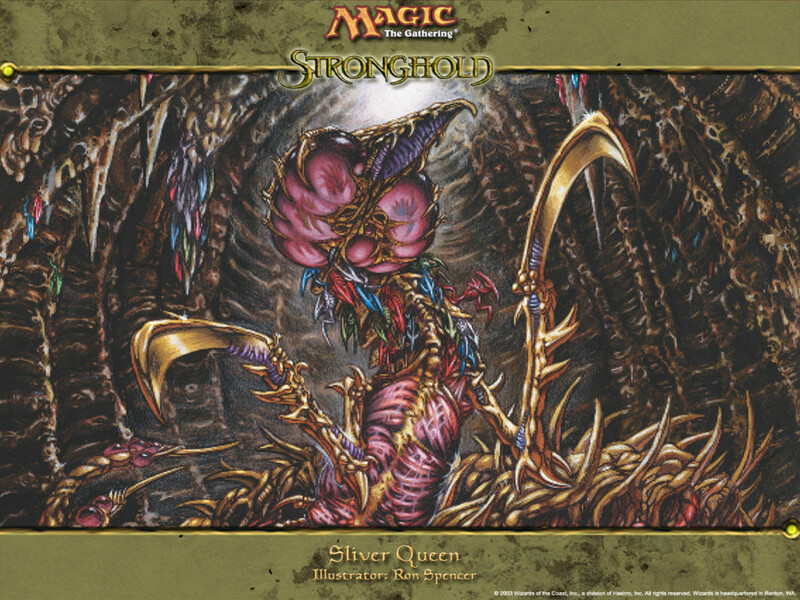 Official artwork for Sliver Overlord. 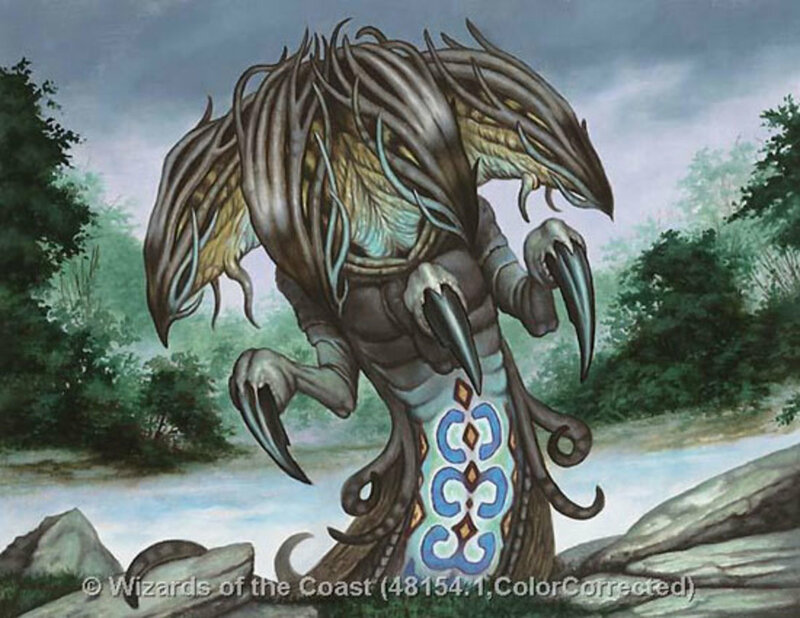 This is a major creature card that you should have if you are building a deck around slivers that uses all five colors. It is also a good card to have if you have an opponent who is also playing with slivers, too. When making an Elder Dragon Highlander (EDH) deck, you may want to build around a theme. By picking a theme to build around, it gives you an idea of what type of EDH deck you want to create in preparation. This will affect which card you will have as your general and what cards are going to go into your deck. However, you do need to be mindful of what cards let alone generals are not allowed in the EDH format. Being introduced to the EDH format, I found this to be one of my favorite formats of Magic the Gathering. Depending on what type of EDH decks are in play, a game of MtG via the EDH format could last a couple of hours. 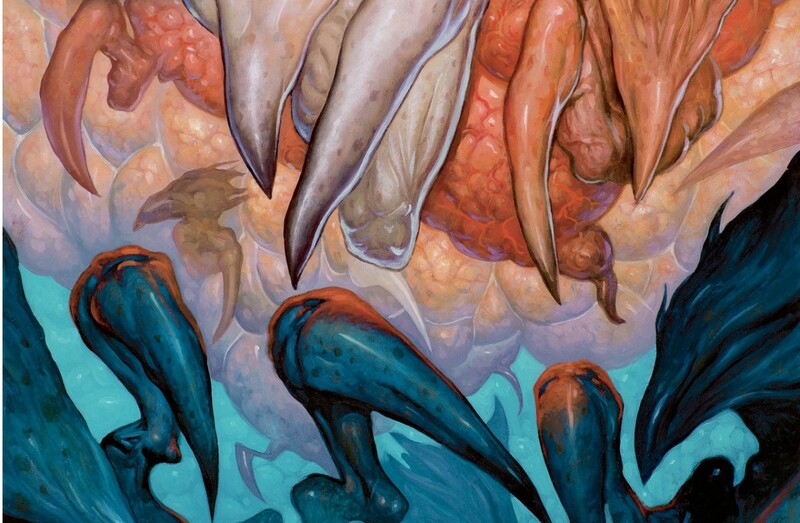 Having played a lot with Slivers in the past, I felt that it should be obvious that I go ahead and create a deck that revolved around those creatures. It took me months to build the deck as it took hours of playtesting and money to find the necessary cards. This is the type of deck that caused much player hate to be headed in my direction. If you build the deck wisely, such as factoring in mana fixing and acceleration, you can get an army of slivers onto the battlefield in a couple of turns. Then, you can go to work on your opponents. However, not all slivers are best used for pure offensive combat as there are slivers that possess abilities that pass onto the other slivers as long as they're still alive. You can make your opponents feel like they're in the prison showers at Oz. Typical standard EDH format, this deck has 100 cards with one of them being the designated legendary creature being used as the general. When I first created this EDH, I picked the Sliver Queen as my general. To me, it seemed to be obvious as it was five colors and could spawn me an army of sliver tokens. After playing a couple of rounds, my friends suggested that I should replace Sliver Queen with the Sliver Overlord. When you look at the different abilities between the two cards, you could see that Sliver Overlord would be a better general than Sliver Queen. Using the Sliver Overlord, I went ahead and kept Sliver Queen in my deck as a regular creature card. Like the Sliver Queen, the Sliver Overlord costs one mana of each color to put into the battlefield. With mana acceleration, it wouldn't matter how many times the Sliver Overlord gets taken out of battle. I found its two abilities to be rather attractive. To activate those abilities, I only need to pay three mana of any color. Also I don't have to tap the Sliver Overlord to use those abilities. Even before my turn, I can go ahead and find a sliver card. If I have enough mana, I can put the card onto the battlefield for the next turn. If anybody tries to steal my slivers, I can activate Sliver Overlord's second ability that allows me to take control of a target sliver. For any Sliver EDH deck, it's a good idea to have the Sliver Overlord as your general. That way, you have a good chance to get the sliver cards you want to get onto the battlefield. Official artwork for Sliver Queen. Any sliver deck should have at least once Sliver Queen in the library. Its abililty allows you to spawn an army of sliver tokens at your disposal. Official artwork for Sliver Legion. If you are building up an army of slivers, then you need to have Sliver Legion. It's ability allows your army to get stronger as long as you are pumping out more slivers. I kept to the theme of Slivers; as a result, all of my creature cards are slivers. I have an army of slivers of different colors in the deck. The main trick is picking slivers that have abilities that can get you out of most jams. While the key to winning with this deck is offense, you cannot be too focused on offense. This deck shares concepts with the combat sport of mixed martial arts (MMA) which means you have to be prepared for all different kinds of opponents and that you should take a win any way you can get it. While going on the offensive is fun with this deck, you have to be prepared for opponents that come prepared. These are the following slivers I have placed in my deck. Sliver Queen - 1 Mana Of Each Color; I felt this one was a must have because I can use that card to spawn an army of sliver tokens. Combined with other sliver cards on the battlefield, I would have a pretty large army. Sliver Legion - 1 Mana Of Each Color; I felt this was also another important card. This card, when in play, gives slivers +1/+1 for each other sliver in play. When combined with the Sliver Queen, I can use the sliver tokens to pump up the offense and defense of my slivers. Crystalline Sliver - 1 Blue & 1 White; I felt this was important because of its Shroud ability. Darkheart Sliver - 1 Green & 1 Black; This creature ensures that I can gain life. If I have a bunch of disposal slivers, such as the sliver tokens, I can ensure that I remain in the game. Dementia Sliver - 1 Blue, 1 Black, & 3 Colorless; I haven't had the chance to effectively use this card yet. However, this is an effective card to have in your deck combined with the blue enchantment Telepathy. If you can get both cards onto the battlefield, then Dementia Sliver is very useful. Victual Sliver - 1 Green & 1 White; Same thing as the Darkheart Sliver. Necrotic Sliver - 1 White, 1 Black, & 3 Colorless; Being able to destroy permanents is valuable nowadays. With the existence of planeswalkers, you need a quick and effective way to take them out. Harmonic Sliver - 1 Green, 1 White, & 1 Colorless; This lets you destroy Enchantments. Battering Sliver - 1 Red & 5 Colorless; Gives all Slivers Trample. Fury Sliver - 1 Red & 5 Colorless; Gives all Slivers Double Strike. 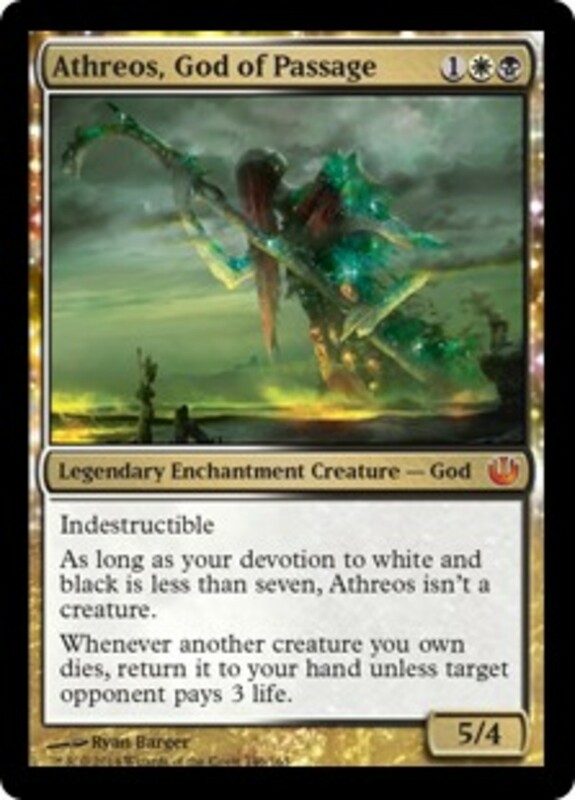 You can replace this card with Bonescythe Sliver from M14. It gives the same ability as Fury Sliver for only one white mana and three colorless mana. Heart Sliver - 1 Red & 1 Colorless; Gives all Slivers Haste. Two Headed Sliver - 1 Red & 1 Colorless; Makes it that opponents need at least two creatures to block any one of your slivers. This comes in handy with Spined Sliver, Battering Sliver, and Fury Sliver. One sliver, if pumped up enough, can take out two or three weaker creatures. Poultice Sliver - 1 White & 2 Colorless; Gives an effective way to regenerate slivers. Essence Sliver - 1 White & 3 Colorless; Gives your slivers Lifelink. Talon Sliver - 1 White & 1 Colorless; A good safety before getting out the Fury or Bonescythe Sliver. Pulmonic Sliver - 2 White & 3 Colorless; Its ability comes in very useful if you can get it in play early enough. Vampiric Sliver - 1 Black & 3 Colorless; An effective way of being a jerk to your opponents. Clot Sliver - 1 Black & 1 Colorless; A cheaper version of the Poultice Sliver. Crypt Sliver - 1 Black & 1 Colorless; A very cheap and effective way of regenerating Slivers. Brood Sliver - 1 Green & 4 Colorless; Gives you an incentive to be aggressive and offensive. Spinneret Sliver - 1 Green & 1 Colorless; A good safety against Flying creatures. Quick Sliver - 1 Green & 1 Colorless; It's Flash ability is handy. This should not even be a common card. Root Sliver - 1 Green & 3 Colorless; Handy against counter spells. Virulent Sliver - 1 Green; An effective way to quickly beat opponents. Gemhide Sliver - 1 Green & 1 Colorless; Effective mana fixing and acceleration. Fungus Sliver - 1 Green & 3 Colorless; Very useful ability. Screeching Sliver - 1 Blue; Helps you win my milling an opponent's deck. Synchronous Sliver - 1 Blue & 4 Colorless; Gives Vigilance to all Slivers. Can be replaced by the M14 card Sentinel Sliver. Telekinetic Sliver - 2 Blue & 2 Colorless; Kind of like using Brazilian Jiu-Jitsu in MtG. Winged Sliver - 1 Blue & 1 Colorless; Gives all Slivers the Flying ability. Can be replaced by Galerider Sliver from M14. Official artwork for Reflecting Pool. 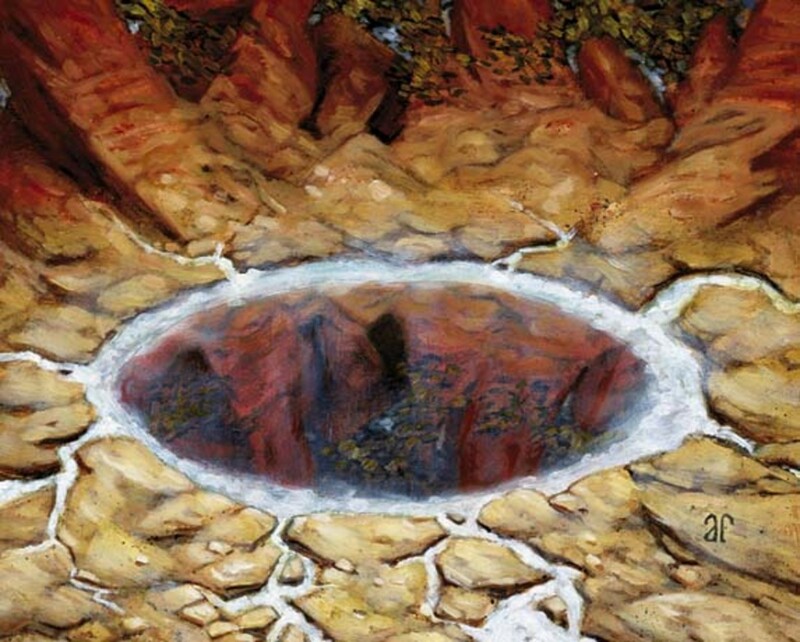 In any multicolored deck, Reflecting Pool is invaluable to have because you can virtually tap for any color of mana. If you have lands that produce all five colors of mana, then you can tap Reflecting Pool for one mana of any color without consequence. Official artwork for Exotic Orchard. 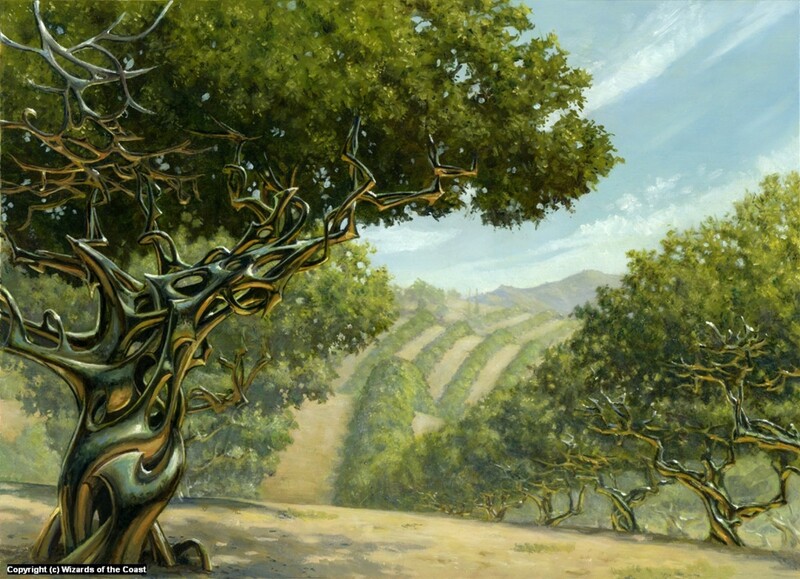 Exotic Orchard is an invaluable land card to have in your deck if you are running anywhere from 3 to 5 colors. It is great to have if your opponents are running the same colors you are. It's incredibly crucial to have lands in your deck. Due to the EDH rules and my serious need of mana fixing, I decided not to run any basic lands. I didn't want to take the gamble on getting certain lands. Since it ended up costing me quite a lot of money, I went and ran with nonbasic lands. However, I didn't bother going with the original dual lands as they are very expensive to purchase. But, I am satisfied with the land cards that I have in my deck. Since this is a five-color deck, mana fixing is very important. These are the following lands I used. Coat of Arms - 5 Colorless; This works in the similar purpose as Sliver Legion. But, this card pertains to all creatures. Since I'm using a Sliver deck, I went ahead and put this in to beef up my creatures. Eldrazi Monument - 5 Colorless; The upkeep cost shouldn't affect you as long as you have disposable slivers. Telepathy - 1 Blue; Makes opponents play with their hands revealed. I use that with the Dementia Sliver. Wild Pair - 2 Green & 4 Colorless; Enables you to get creatures onto the battlefield faster. Beastmaster Ascension - 1 Green & 2 Colorless; Gives you an incentive to be offensive. Mana Reflection - 2 Green & 4 Colorless; Doubles your mana. Maelstrom Nexus - 1 Mana Of Each Color; Useful due to its Cascade ability. Combined with Wild Pair, you have a chance of getting 3 creatures onto the battlefield. You are mainly going for offense with your slivers; but, you want to amass an army of slivers just make sure you're protected. Slivers are pretty much the "Allies" (introduced in the Zendikar block) of the past. They play off each other's abilities. In terms of offense and defense, you can amass an army of juggernauts. However, you want to utilize abilities of specific slivers to do away with your opponent's offenses and defenses in the process. That's where cards such as Telekinetic Sliver, Dementia Sliver, Telepathy, and so forth come in. Offense is your main goal, but you want an intelligent offense. If you can go offensive, the sliver cards do give you other options than attacking. Classic combo for slivers... sliver queen and mana echoes. Sliver queen obviously. 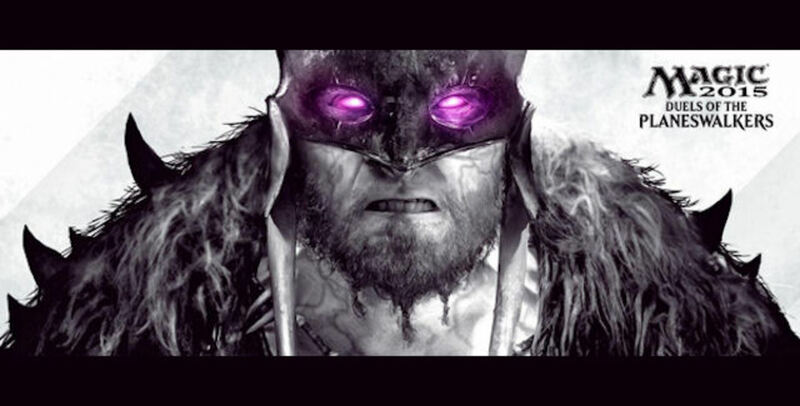 Tap 3 colorless add a 1/1 colorless sliver token on the battlefield. Mana Echoes, whenever a creature enters the battlefield add 3 colorless mana for each creature that shares a creature type with it. When you play one you get get... (surprise surprise) a ton of mana each... repeat the process infinitely. Pairs very well with necrotic sliver or clot sliver.